Includes Power Cable. Input : 100-240V 1A 50/60HZ Output: 10.5V 2. [.4] For sale is a Sony Black AC Adaptor No Cable. AC-UB10 USB AC Wall Adapter. Output 5V 500mA. They work very hard to get quality products to you quickly. FOR WALL OR USB CHARGING. Fits any mini usb connection! One (1) Genuine Sony. Sony USB A Socket to USB Micro A Plug for Sony S1 Tablet. CA, FL, HI, IN, NJ, PA, SC, TN. 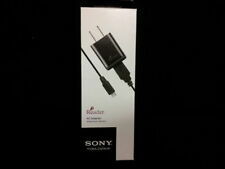 Sony Reader AC Adapter PRSA-AC10 Tablet 1AMP 5 Watt. Location: #Z22 Sony Adapter Only. Compatible Product Line: Universal. Condition: New. AC-UB10D AC Adaptor. power adaptor /. They work very hard to get quality products to you quickly. 4548736032866PowerLine USB-C & USB 3.0. high durability premium cable. by technology - more than 20 million trust of quality. highly durable nylon that has been knitted into a double to the outside, use a high-durability material to the inside. Trending at $23.92eBay determines this price through a machine learned model of the product's sale prices within the last 90 days. SONY AC-S5220E AC Power Adaptor for SONY Readers. Like New AC Adaptor for SONY PRS-505 and Equivalent. Includes AC Cord. 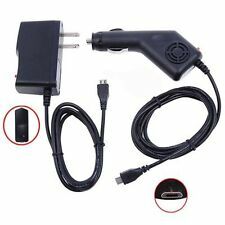 SALE :Original/Genuine Sony A/C adaptor with Power Cable, for eReaders PRS 300, PRS 500, PRS 505, PRS 600, PRS 700 and PRS 900. The picture you see is theactual item for sale. What you get is what you see. Lot Of 10 Sony Reader AC Adapter 1AMP Power Brick. Location: #Z22 Adapter Only Pull 10. Lot of ten. Original accessories may or may not be included. Category: Electronics Accessories. Compatible Product Line: Universal. Power adapter is included along with screen protectors. Brand new, new used in original box item. Small tear on box. SONY Xperia Z4 Tablet. 1 x Genuine SONY CP-CDAM2/B. 1 x Genuine SONY EC803 Micro-USB to USB Cable. - Output: DC 5V Max 4.8A (2 ports Max / 1 Port Max 2.4A). - Weight: 24g. GENUINE OEM SONY eReader Reader AC-S5220E AC POWER ADAPTOR ADAPTER 5.2 V EUC. Condition is New. Shipped with USPS First Class Package. ITS FOR SONY SGPT121 131 132 122 SERIES XPERIA TABLETS. ITS NEW SONY FPC190 MULTUPORT USB CONNECTOR. Sony Digital Camera Battery Charger And USB For Picture Viewing . Walkman Player. Device Supported iPod. Manufacturer Sony Corporation. iPod Player. Product Type Battery Adapter. Device Supported USB Device. USB cable, manual, any cables, any accessories, etc. ARE NOT included. 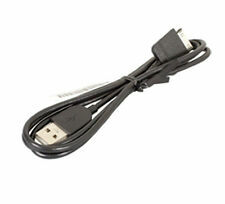 IN NEW CONDITION & ORIGINAL Sony XPERIA Tablet USB-cable cable cable USB SGPUC2, SGP-UC2, 196835511. You need energy?. You need information?. The cable is a multi-port to standard USB adapter. Connect Tablet and PC. IN NEW CONDITION & ORIGINAL Sony XPERIA Tablet USB-cable cable cable USB SGPT1211. You need energy?. You need information?. The cable is a multi-port to standard USB adapter. Connect Tablet and PC. Contents: Sony USB cable black. Supports 100 to 240 Volt AC 50/60HZ. For Sony E Book Reader PRS-350, PRS-650 and PRS-T1. Plus PRS-T2. Sony PRSA-AC1A AC Adapter. Sony PRSA-AC1A Adapter. Supplied with AC Adapter, Power Cord, USB Cable & User Guide. Sony Xperia Tablet S SGPT12/SGPT13 Series. Interface: Multi port / USB Standard-A. Total length: Approx. 100 cm (ref to the picture). Weight: Approx. Note:Not all compatible models is listed. SUPPLIED MODEL:V150 V190 FPC FLEX CONNECTOR. NEW GENUINE SONY ORIGINAL PART. MADE BY SONY. This SONY PART. is the Original SONY PART which is provided. SUPPLIED PART:A-1918-412-A. TO FIND ANY PART YOU NEED FOR YOUR MODEL ! SUPPLIED MODEL:USB SGPUC3. The adapter plug connects via Xperia tablet's dedicated Multi Port, making it possible to have an AC adapter cord simultaneously plugged in and powering your device. Cable connects directly to Multi Port on Xperia Tablet S.
This USB CABLE (SGPUC2 ). SUPPLIED MODEL: SGPUC2. is the genuine USB CABLE which is provided with the TABLET in the box. NEW GENUINE SONY USB CABLE. (when you bought the TABLET ). MADE BY SONY. SUPPLIED MODEL: SGPAC5V5. WITH OUT POWER CORD FOR SGPAC5V5. This SONY PART. is the Original SONY PART which is provided. NEW GENUINE SONY ORIGINAL PART. MADE BY SONY. with the MAIN UNIT. NOT COPY/CLONE. This SONY PART. is the Original SONY PART which is provided. NEW GENUINE SONY ORIGINAL PART. MADE BY SONY. WITH OUT POWER CORD FOR AC-M1208WW. THE PART FOR YOUR MODEL ! Compatible with. , Handycam® and Bloggie?. models that support USB charging. [.4] For sale is a Sony Black USB AC Adapter. AC-UB10B USB AC Wall Adapter. They work very hard to get quality products to you quickly. Item Type: Book Readers & Tablets. Compatible Product Line: Universal. Factory Sealed. Location: #W27. Signs of wear can include aesthetic issues such as scratches, and discoloration.